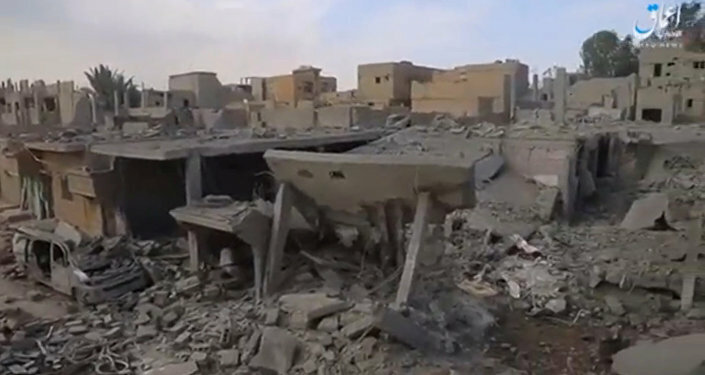 At least 40 civilians have been killed in airstrikes conducted by the US-Led Coalition on a community in Syria's Deir ez-Zor on Wednesday, SANA news agency reports citing local sources. The airstrike hit the village of al-Dablan located in Deir ez-Zor governorate, SANA reported. The majority of victims were women and children. "The [US-led] coalition carried out airstrikes on the civilians' homes in al-Dablan village in the area of Mayadin," the report said. "[The strikes] led to the deaths of more than 40 civilians, the majority of which were women and children, as well as to dozens of people sustaining injuries." The houses were also damaged in the airstrikes, according to SANA. Local sources told the news agency that the terrified villagers were forced to leave their homes and flee for the desert in an attempt to escape further strikes. On Tuesday, the Syrian Observatory for Human Rights claimed 42 prisoners of Daesh (banned in Russia) died along with 15 militants in a coalition strike in the Syrian city of Mayadin on June 25. SANA reported that at least 42 people had died in the strike. Operation Inherent Resolve spokesperson subsequently told Sputnik that a civilian team within the US-led coalition against Daesh would assess reports of civilian casualties.